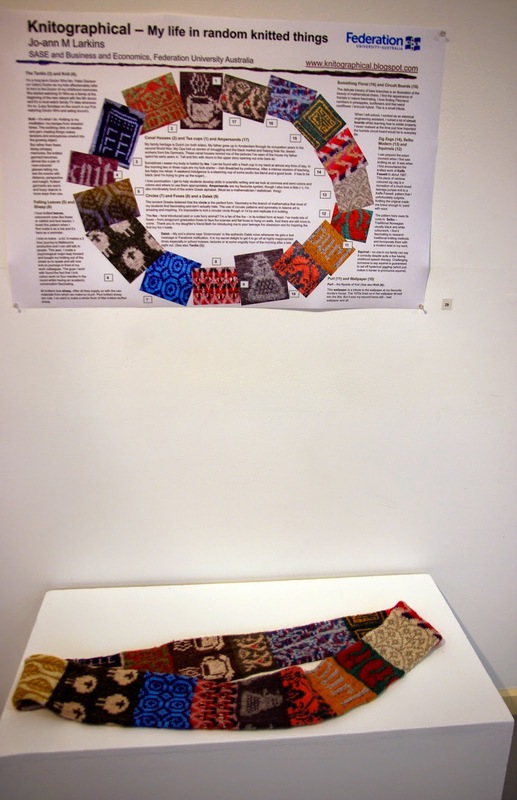 Knitographical: My knitting as art! You know, I have this weird little phobia about putting myself out there as a known knitter. 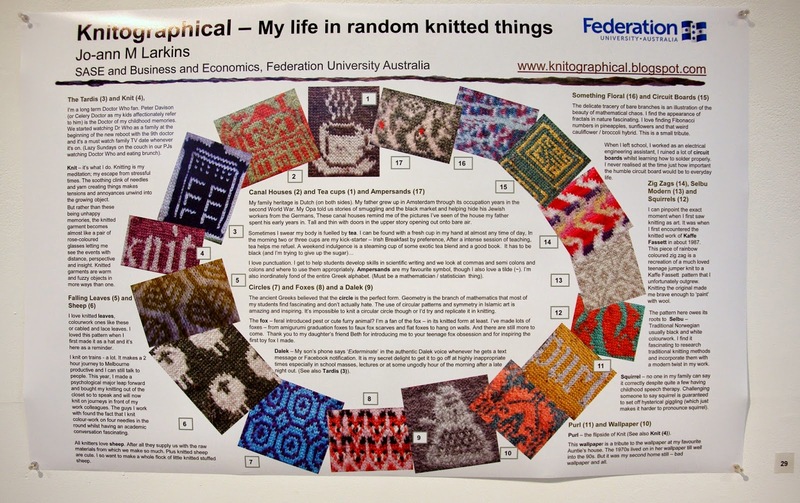 I knit every day but rarely in public (except on public transport. That definitely doesn't count as in public, right? One needs knitting just to get through long haul train journeys). I don't take my knitting to work. (That might be to limit the temptation to knit when I should be doing boring work related things though). 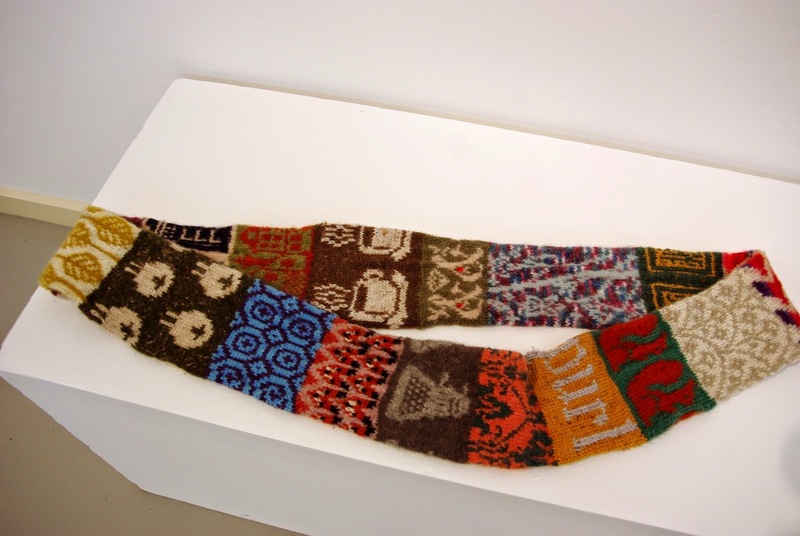 I'm happy to blog about knitting however - because after all the internet is full of friendly fiber people who don't think I am any weirder than they are. Sometimes you just have to be brave and put yourself out there and hope everyone else gets what you were trying to say. Every couple of years, the art gallery at the University I work for has a staff art exhibition. Last time I thought I should enter something as there was a lot of craft type works entered (mainly quilts and embroidery). But I wasn't brave enough to put myself out there for potential criticism. Then the invitation came around in the email in early April and I plucked up my courage and thought, 'Why Not What have you got to lose?' (Of course a little inner voice muttered things about public humiliation but I ruthlessly suppressed it). It's a perfectly legitimate art show. See, you can read all about it here: The Autumn Salon. 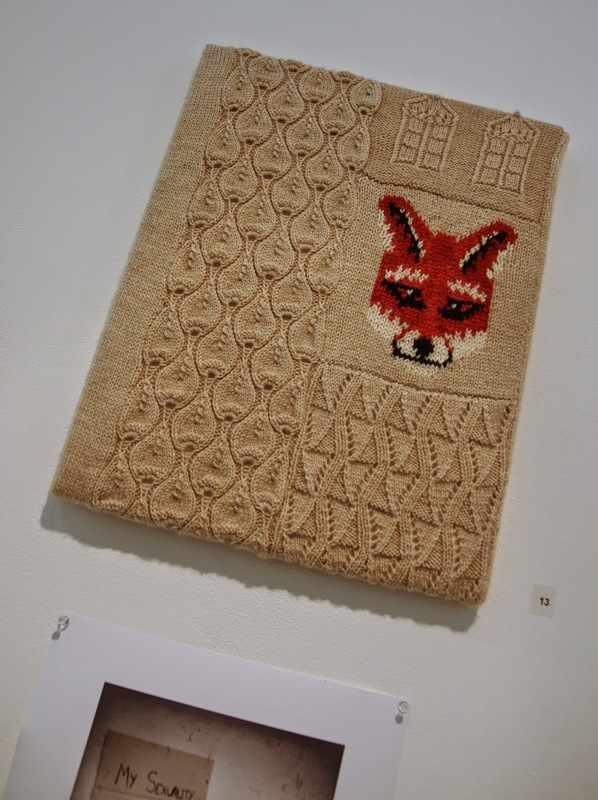 So I entered two pieces of work, the Knitographical cowl and Flat Fox. And then I had to do an even braver thing - attend a gallery opening. First the, What Do I Wear? dilemma. I want to look arty but still me. The small talk over wine and cheese. Taking my family out in public to mix with the arty types and hoping they wouldn't embarrass me in public. (They tried very hard to). The text of this poster is basically reproduced in this post: Story telling with sticks and string. This cowl is all about my story so it needed its story to be told. this is the most fun academic poster I have ever made. I had someone come up to me and tell me that the cowl was like my own coat of arms. I thought that was a really cool way to put it. For more details of Flat Fox see this post. 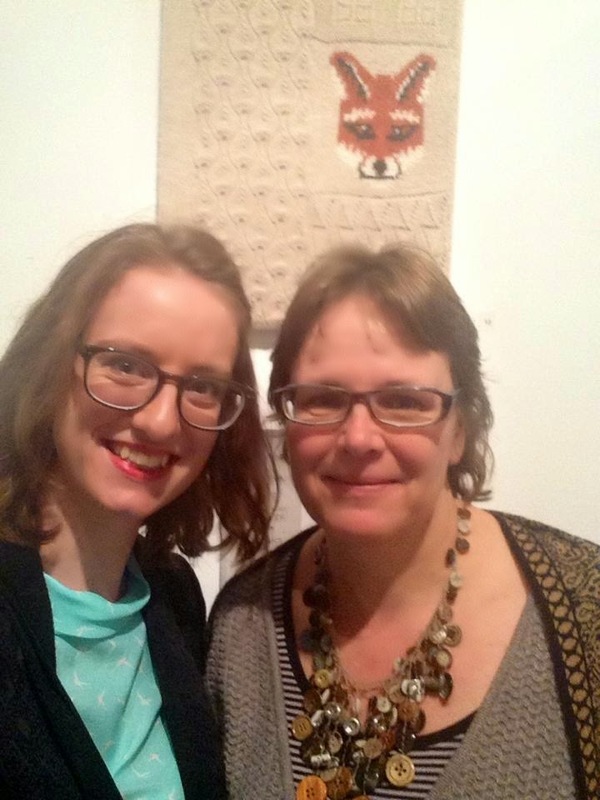 Mel and I taking a selfie at the gallery opening. Congratulations, perfect pieces to include in the show. Thanks. I'm glad you took the time to comment.